Nintendo has announced a new Nintendo Labo Toy-Con Kit to join the ranks of the Variety kit and the Robot kit. Named the Nintendo Labo Vehicle Kit, the pack will come with all new Toy-cons like a car, a submarine, a plane, a pedal, two keys and so on. Players will also get to enjoy new games with their Toy-cons, exploring the depths of the ocean to the limits of the sky. REDMOND, Wash.–(BUSINESS WIRE)– Buckle up for a new adventure while sitting in the driver’s seat of a car, a submarine and a plane with the Nintendo Labo: Vehicle Kit, launching on Sept. 14. This new Nintendo Labo kit is designed to work with the Nintendo Switch system*, and contains materials to build a variety of customizable cardboard creations called Toy-Con, including a Car, a Submarine, a Plane, a Pedal, two Keys and more. By inserting one of the assembled Keys into any of the vehicles, players can enjoy a variety of fun games and activities. Changing between vehicles while adventuring is a cinch – simply pull the Key out of one and slot it into another to transform from an airplane pilot to a submarine captain! 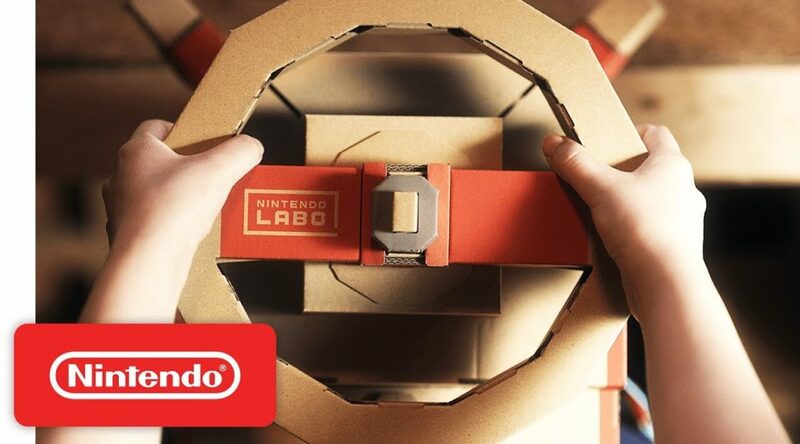 Since its introduction in April, Nintendo Labo has inspired new ways to play by combining the family-friendly fun of DIY creations with the technology of Nintendo Switch. Nintendo Labo: Vehicle Kit will unlock even more ways for people to make, play and discover together, as they speed through races, battle cars equipped with extendable arms and explore a mysterious world. Each vehicle features its own controls and special moves, and with the second Key, players can even invite a co-pilot along on their in-game journey. Interacting with the assembled Toy-Con creations instantly translates into in-game actions to create a truly immersive experience – from pulling the cord on the Car to pop a wheelie, pushing the button on the Submarine to launch a grappling hook and so much more. As with every Nintendo Labo kit, Nintendo Labo: Vehicle Kit includes its own unique Nintendo Switch software designed to work with the included Toy-Con projects. Enjoy the fun of making each Toy-Con creation, playing immersive games with them, discovering how they work and even inventing new ways to play. All materials needed to complete each Toy-Con creations are included – no glue, tape, or scissors required! The possibilities of Nintendo Labo: Vehicle Kit can be expanded even further with Toy-Con Garage. This intuitive and interactive programming tool is included with every Nintendo Labo kit and features a simple, visual interface and handy tutorials designed for players of all ages. Toy-Con Garage encourages players to experiment with the Toy-Con creations they’ve built or craft their own original designs using handy household items like paper cups, stickers and ribbon. With Toy-Con Garage, the possibilities of Nintendo Labo become almost limitless – players of all ages can enjoy hours of inventing, tinkering, crafting, playing and enriching fun. Pre-order the Nintendo Labo: Vehicle Kit from select retailers for a suggested retail price of $69.99. Stay tuned to the Nintendo Labo website for more information about Nintendo Labo: Vehicle Kit. To start making, playing and discovering right now, check out the Nintendo Labo: Variety Kit and Nintendo Labo: Robot Kit, which are currently available in stores at suggested retail prices of $69.99 and $79.99, respectively.